I'm glad I gave this simple ingredient a shot. The other facial oils I've tested have been cocktails. This one, however, keeps it to one single ingredient. This one ingredient has generated a lot of hype. Argan oil is touted to minimize fine lines, restore elasticity, improve skin tone, soothe irritation, neutralize free radicals that cause the signs of aging, protect the skin from harmful environmental agents, and promote cell regeneration. Quite bold claims if you ask me. It turns out, however, that several of these claims have scientific backing. Argan oil is rich in unsaturated and monosaturated fatty acids: oleic and linoleic acids with a high content of tocopherols, phytosterols, and phenolic compounds. Argan oil has been shown to protect the skin from UV radiation and decrease the membrane susceptibility to peroxidation, one component of the aging process. In addition, the high content of polyphenols is the suspected cause of its ability to prevent the deterioration of collagen. After accepting that argan oil wasn't just hype, I finally caved and sampled Kahina's 100% Organic Argan Oil. Kahina uses argan nuts gathered in Morocco from the region of Taroudant, which are smaller, but the most nutrient dense variety. Kahina works with women's cooperatives in Morocco, which ensures that the women of the Berber tribes earn a living wage for collecting the tree nuts and receive health care. I have sampled a wide variety of facial oils and they all have a different personality. 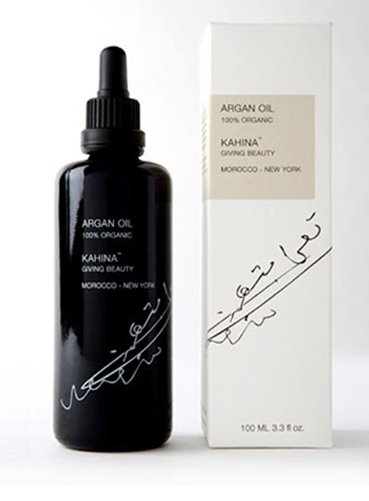 Kahina's was refreshingly moisturizing without appearing oily. During my trial I didn't have a single breakout, which is some evidence for it's ability to balance hormonal skin. It had a very delicate nutty scent, which I found pleasant in comparison to the stronger herbal smells of other natural brands. After several weeks of use I found that it reduced redness, provided a fullness to my skin and gave me a healthy glow. I just found myself a new favorite.